as sharply as any weapon. Fenris: How have the templars not killed you? SPOILERS for all of Dragon Age (Dragon Age II, Awakening, and Inquisition)! I'm not kidding. Huge spoilers. HUGE. Read at your own risk! What's the central conflict at the heart of the Dragon Age universe for you? Grey Wardens versus Darkspawn? Inquisition versus Corypants? Chantry versus Old Gods? Elves versus mortals? Ferelden versus Orlais? Tevinter or the Qunari versus the rest of Thedas? For me, ultimately, the central conflict of the entire trilogy is the tragic and eternally bloody conflict of mages versus templars. And at the center of that debate is a single character, reviled, loved and debated beyond any other, from Dragon Age II. In other words, gird your loins, folks, I'm gonna talk about Anders. And many have done so, both for and against, for and balanced across all interpretations, across the fandom. So here's my initial take (I'll have more to say in my post on his romance in the future as well). Here we go! To begin with, let's flash back. Near the end of Dragon Age II, things aren't looking good for our misfit band of heroes. Meredith is openly discussing enacting the Right of Annulment, to slaughter all mages in the Kirkwall Circle, when Hawke shows up. It's a surprisingly complex scene, as Orsino begs Meredith for time and sanity, and Meredith turns to Hawke and, in one of my favorite scenes for her in the game (and beautifully acted by voice actress Jean Gilpin), she comes pretty darned close to begging Hawke for understanding. Meredith: What other option do we have? Tell me, Champion, that you have not seen with your own eyes what they can do... heard the lies of mages that seek power. Hawke: Some of us weren't exactly what you expected. We're not the enemy. Orsino (to Meredith): You would cast us all as villains. But it is not so! Meredith (near tears): I know. And it breaks my heart to do it. But we must be vigilant. If you cannot tell me another way, do not brand me a tyrant! Orsino (firmly): This is getting us nowhere. Grand Cleric Elthina will put a stop to this. Meredith: You will not bring Her Grace into this! Anders: The Grand Cleric cannot help you! Anders: I will not stand by and watch you treat all mages like criminals, while those who would lead us bow to their Templar jailers. Anders: The Circle has failed us, Orsino! Anders: Even you should be able to see that. (The 'Justice' light fades from Anders's face...) The time has come to act. There can be no half-measures. Hawke: Anders... what have you done? 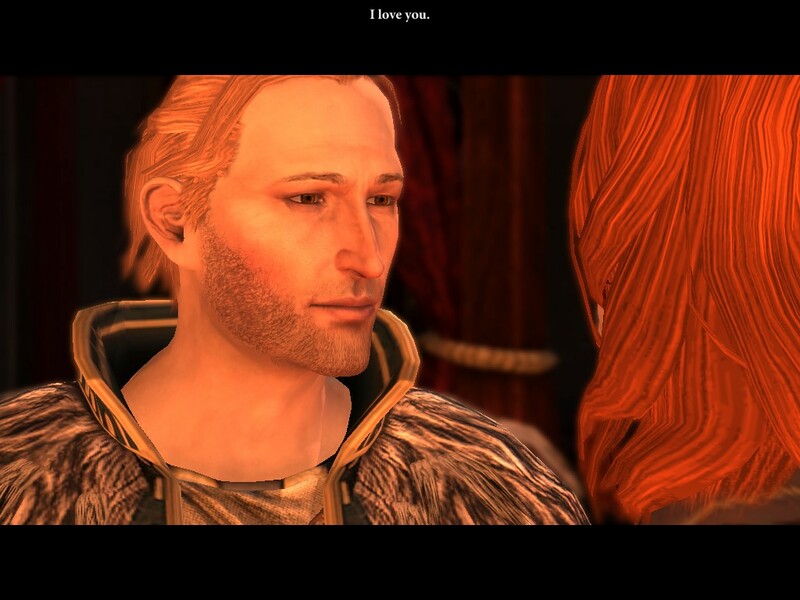 Anders (looking away from Hawke): There can be no turning back. decimated by both fire and magic. We then view the cathedral-like magnificence of the Chantry building in all its imposing and towering glory, and then cut to a scene inside, as a growing rumble grows around Grand Cleric Elthina and the other Sisters. A fiery red column of fire suddenly explodes up through the center of the Chantry aisle and into the ceiling, as they watch, horrified and trapped. And then we're watching from afar again, from a beautifully cinematic master shot high above the city as the Chantry explodes in an even more massive pillar of real and magical fire that ignites the heavens and city around it in every direction (and massive kudos to director Mark Darrah here, as well as to the rest of the artists and effects team because it's utterly an unforgettable scene). As the fire climbs to the sky, the Chantry's external religious statues topple from their pedestals (a wonderful and subtle note) as composer Inon Zur's music soars in a theme that is both heavenly and demonic. 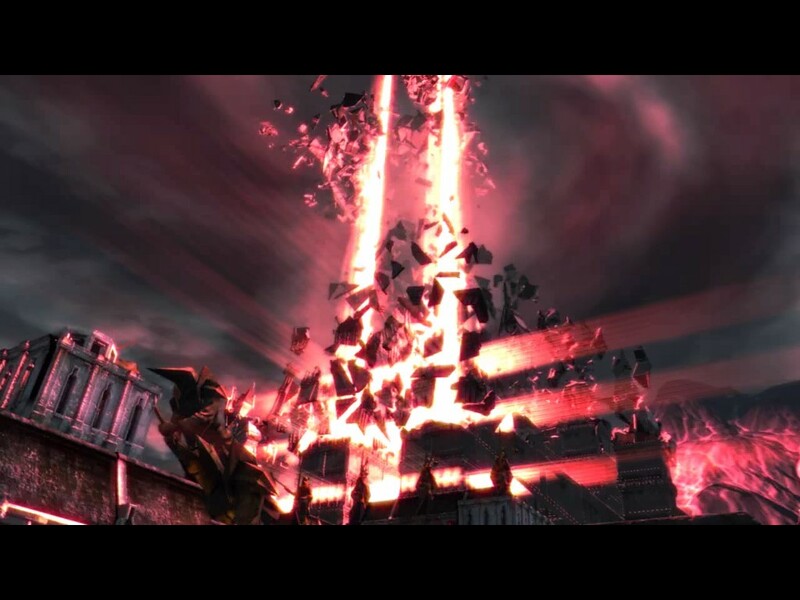 In a tragic, terrifying yet absolutely gorgeous visual moment, the building is decimated by both fire and magic, as red lines of power emanate both vertically to the sky as well as outward horizontally in every direction even as the massive column multiplies. For a moment, the world seems to hold its breath, and as horrible as it is, there's something transcendent here, too, as if the building itself is being lifted, opened, in a blaze of pale fire, as if the very wrath of the Maker has in fact descended to earth and lifted it in an invisible fist. And then everything crumbles and the explosion becomes an implosion, the Chantry gone, the rubble whirling and coalescing tightly around the column of fire for the briefest of seconds—and then a second explosion obliterates everything else and blows it into powder, both earth and sky, and raining destruction down upon the city areas around it. And seriously, any remaining Kirkwall citizens who've survived the corrupt templars, the blood mages, the Qunari devastation, and more have got to be fed up by now—I mean, those poor people. Either way, in seconds there's nothing left of the Chantry but ashes, and no more chance for compromise or peace, among mages and templars. The fury of the wounded mage has, indeed, shown why mages should be feared. And now the sky falls as a result. Everyone present, except for Anders, reacts predictably in the pause to follow, crying out in horror. Anders, cool and remote and ready for death, simply responds: "I removed the chance of compromise... because there is no compromise." This is not only tragic, but also a good place to shout out to writers including the always-brilliant David Gaider, who wrote the deft, light/dark Anders in "Awakening," and to Jennifer Hepler for her complex portrait of Anders to follow, which is both passionate and funny, and yet grim and fatalistic. She knows Anders through both prose and script, as seen throughout Dragon Age, both in DA2 and most especially in her searing short story on his terrifying and confused awakening from the joining with Justice—check it out here. Meanwhile, what happens next? Well, as you probably know... it's not great. Orsino: The Circle didn't even do this! Champion, you can't let her. Help us stop this madness! Meredith: And I demand you stand with us. Even you must see that this outrage cannot be tolerated. Anders (to Hawke): It can't be stopped now. You have to choose. Hawke: Was that why you needed me to distract the Grand Cleric? Anders: If you knew what I was doing, you would have felt honor-bound to stop me. I couldn't take that chance. The Circle is an injustice. In many places beyond Kirkwall. The world needs to see! Sebastian: Elphina is not the Circle. She was a good woman. And you murdered her. Orsino: You fool, you've doomed us all. Anders: We were already doomed. A quick death now or a slow one later. I'd rather die fighting. Hawke (one of many options): You're a murderer. The Grand Cleric. The mages. Their blood is on your hands. Meredith: It doesn't matter. Even if I wished to, I could not stay my hand. The people will demand blood. Then Hawke must choose the outcome—to kill Anders or allow him to try to mitigate his act by helping to save Kirkwall in the bloodshed to come. And Meredith draws her line in the sand (rather understandably, at least until she calls for the Right)... and it all goes to hell. Anders wants to make a statement. But he's also officially lost himself, killed hundreds, doomed the very mages he wanted to help, and changed the face of Thedas forever. How did we come to this? Well, let's look back... to the creation of Anders. 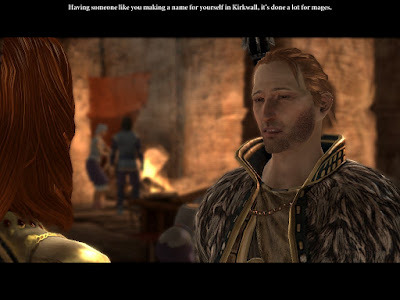 The secret of Anders when we first meet him in Dragon Age: Awakening (the wonderful DAO DLC that is seriously almost a full game chapter on its own) is that every joke carries with it a secret abyss of loss, damage, and self-loathing. Truth is, at least as I see it, Anders isn't funny because he's adorable and lighthearted; he's funny because he's walking on a very narrow wire and every single moment of humor or joy he can summon pulls him forward across the darkness. Think I'm kidding? What's his name? What's Anders's real name? We don't know. And that's the brutal truth of it, that we'll never know. Unless he survives the events of Dragon Age II and perhaps whispers that truth to a romanced Hawke, far away from the poisonous aftermath of that apocalypse, confiding in the darkest and sweetest corners of their nights together, able to be vulnerable at last (providing, of course, that the corrupting spirit of Justice has been either reduced or expelled). Forget DA2's Fenris; the funniest person we meet in Dragon Age: Awakening turns out to really the one with the capacity to rip out hearts... at least, figuratively. crafted and sharpened by the Chantry. Make no mistake: Anders does a heinous and unforgivable thing. The wrongness of his act cannot be forgiven or undone. The thing is, though, I feel that in many ways Anders was created by the Circle system; a weapon forged, crafted and sharpened by the Chantry, by a system of corruption, fear and abuse of power, and by the corrupt and cruel among the templars themselves. He was created as a bright and shining blade; one that the Chantry ultimately found turned against itself. And that blade was sharp. So let's look at the creation of Anders. Anders's family came to Ferelden from the Anderfels, the ancient land in the Northwestern part of Thedas. 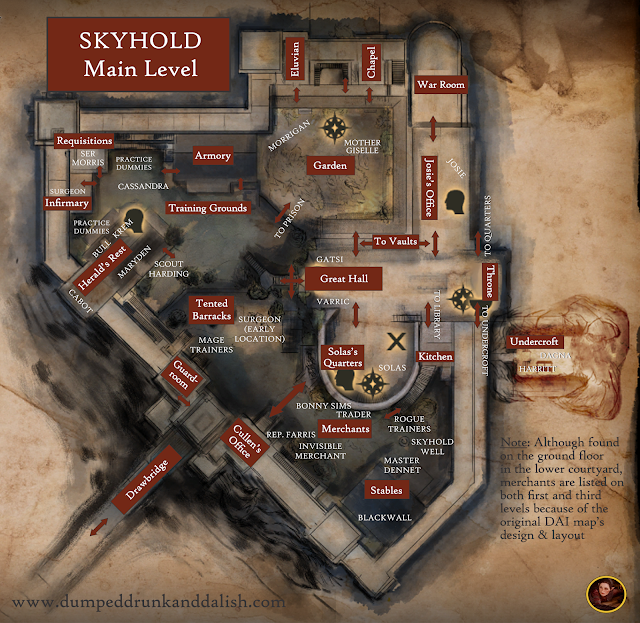 The people of the Anderfels are survivors, to say the least, having stubbornly gotten through catastrophe after catastrophe, from centuries of intermittent occupation by Tevinter, desperate suffering under three of the four Blights, constant attacks by Darkspawn, and political upheaval. Even the weather is a study in extremes of hot and cold, of sun and storm, and the land itself is grimmer still, a series of rocky, shrub-covered steppes broken up by rocks and mountains to the west and south, hills to the North, and seas to the far east and west. In World of Thedas, Brother Berard, a Perendale Chantry cleric, described the Anderfels as "absolute desolation," and as a place evidently abandoned by the Maker. Anders's father apparently retained strong ties to his home, even if he had left as a boy, so it's not surprising that quick, funny little Anders grew up with stories of the Anderfels and a sense of pride in his origins. With his confidence, intelligence and wit, Anders was apparently popular and well-liked in his little village, and his life up to his twelfth year was evidently content and peaceful. He was content, at least, until his magic manifested, and he accidentally started a fire in the barn. His mother tried to help him, to hide the magic, but Anders's devout father feared mages and that the magic itself was a judgment upon his family from the Maker. He therefore called for the Templars, who took the boy away in chains, by force, devastated and stunned, and with only a small embroidered pillow as his remembrance of his home. 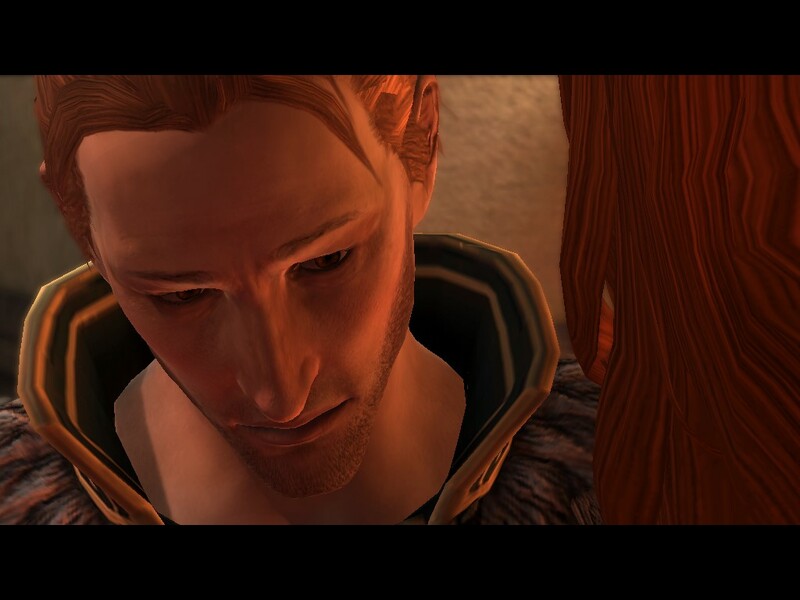 Once taken from everything he loved, Anders was then imprisoned in Kinloch Hold, the Circle Tower in Ferelden. Once in the Circle, Anders refused to speak to anyone for a long time, not even to the other apprentices, so people began to call him "The Ander" because of his heritage, and he took the nickname as the only one he would provide. He was watched day and night by armored soldiers who feared everything he was and everything he might become, and he did not acclimate quickly or well. Do you think he harbored fantasies of being rescued? I do. I think that, as a child, he hoped for someone to come, or for some miraculous event to allow him to go home. And then he stopped waiting for rescue and attempted to rescue himself—he was just thirteen years old when he made his first attempt at escape, and he would make six more over the next several years. This is the thing that I think must be spotlighted: While I'm sure many mages, if not most, acclimatized as a matter of survival, accepted the reality in which they found themselves, Anders was unable to do so. in which the leading cause of death for his fellow mages was suicide. This means that Anders grew up, as far as he was concerned, in prison. Locked in a tower in which the leading cause of death for his fellow mages was suicide. Watched twenty-four hours per day by armed soldiers poised to kill him if he stepped out of line. Some people can disregard the attention of others, yet still others can find attention, the feeling of eyes on their skin, as repugnant and invasive. I believe this was how Anders felt, and that he was either never able to acclimatize to that feeling, or (more likely) refused to. The bottom line is that Anders refused to submit and refused to be caged. He ran every chance he could and I think he was simply incapable of doing otherwise. He just could not take imprisonment, even knowing he'd likely be caught, even occasionally and forlornly turning the chase into a game with the harried and weary templars (not all of them evil or corrupt) who chased, recaptured, and returned him. What I find sad about the entire situation for Anders at Kinloch Hold is that, keep in mind, this was life at one of the gentler, better circles in Thedas (even after Uldred's corruption). My own reaction: Um... ooooookay. Congrats on your forbearance. When he reached adolescence, Anders finally found solace when he fell in love with an older boy named Karl Thekla, and for the first time, he allowed himself the love and connection he had missed since childhood. The two young men were inseparable for a considerable amount of time, became romantically and sexually involved, successfully passed their Harrowings, then Karl was sent to Kirkwall's Gallows mage circle when the Circle requested new talent, and Anders (for the first time in several years) attempted escape once again in order to join him, but was captured at the docks. Anders was able to maintain correspondence with Karl, and was then more severely punished—after his sixth escape attempt, he was put into solitary confinement for a year, with only the tower cat, Mr. Wiggums, for company, a notable story point for the Dragon Age mage who loves cats more than anyone else we meet (except, perhaps, Sten). Tragically, Mr. Wiggums evidently became possessed by a rage demon, but according to Anders, it took out three templars before it was defeated. While this is the most openly cruel punishment Anders endures (he does state flat-out in a banter with Sebastian in Dragon Age: II that he was never personally raped or beaten), it's still a pretty hellish one, because again—it leaves Anders with nothing to do but brood, to sharpen that blade of vengeance and hate, to turn inward and fester. Then Anders ran again, a seventh and final time, and he only then comes to our attention in Dragon Age: Awakening, as having been found at Vigil's Keep, with dead templars and darkspawn about him. He is taken into custody and given the chance to join the Grey Wardens, setting him into our company with the new Warden-Commander—either the Hero of Ferelden if they survived Origins, or an Orlesian Warden (if the Hero perished in the final blow against the Archdemon). Again, I think it's worth pausing and noting that Anders joins the Grey Wardens as a last resort, as a punishment, a sentence, as an alternative to death. He may act blithe about the opportunity, but I cannot see it as anything but one more punishment for the mage who'd survived a ridiculous amount of abuse at that point. He makes a joke. And then twenty more. Because that's what he's been taught to do. But the saddest thing is, I think Anders absolutely is truly jubilant here, and joyful. Genuinely so. Because he's finally escaped. He's gotten away from that blasted Circle tower. Even if he has to risk death by Joining, what does it matter? He's risked death over and over again already. At this point, it's a friend. In other words, even as early as "Awakening," to me Anders was still a tragedy in the making. And, after all, Anders is quick-witted and instantly likable when we meet him in Dragon Age: Awakening. He seems okay, not exactly traumatized, even though I also feel, if we're paying attention, all that lightness is simply a mask as brittle as any Orlesian's. Yet even in those moments, let's face it, Anders is walking a path to a potential guillotine, and never too many moments from death. For me, in playing the game at the time, Anders's blithe acceptance of the risks of the Joining ritual actually were the first moments that really touched me, because I (as someone who finds it terrifying) was touched that this renegade apostate mage would be so eager to join the Grey Wardens, or that he would find it so preferable to a world in which he would be returned to his previous imprisonment. As we proceed through Dragon Age: Awakening, the thing about Anders is that, while he continues to seem charming, lighthearted, funny, and adorably attached to his brave little cat companion (Ser Pounce-a-lot! ), all of this is as much a mask as the masks worn by other deceptive companions before and later. Me, I think that light-heartedness (even this early on) is as deceptive as Morrigan's silence, with her hidden agenda. As deceptive as Bull's, as deceptive as the blithe lies of Solas, Blackwall, or anyone else who deceived us in the trilogy. Dragon Age II for Anders gets a bad rap, as a lot of fans complain about how Anders in Dragon Age II seems to have lost his sense of humor or joy since "Awakening." Me, I always greet these complaints with a squawking Cassandra-noise and raised eyebrows. Because, seriously? It's maybe my headcanon, or maybe I'm picking up on what Hepler is giving us, but: Were you paying attention? Anders was never ever as happy as he seemed, as joyful. Every second of enjoyment was hard-won, from the moment we met him, every bit of humor a flag flown against death and despair. So for me, those who simply want him to go back to being cute and funny seem willing to completely ignore both his origin story and the events and confessions of "Awakening." To recap, let's review what we learn from Anders even as early as "Awakening:"
He's willing to risk the Joining in order to get away. asked, "What took you so long?" 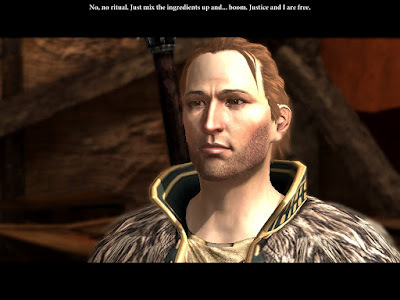 I've taken up far too many words at this point, so more in Part 2, in the future, but I just want to note that there is a reason Anders is the person he is in Dragon Age II. He was honed, sharpened, created, by the very system that mages ultimately rebel against as we begin Dragon Age: Inquisition. Think of a cage, a prison. You are ripped from your family because a talent manifests. You are taken away in chains in childhood with only what you can grab as you are hauled off. You are allowed no further contact. No visits. No correspondence. You are watched every hour of every day by warriors in armor with power over you and all your compatriots, and for YEARS; by those who view you with antagonism, fear, suspicion, or lust. Sometimes they act upon those impulses when they think nobody's watching, and you witness this. Sometimes the worst of them then follow up by making sure the minds of their victims (or witnesses) are wiped via magical lobotomy, to keep their crimes safe, in the Rite of Tranquility, clearing them for future sexual crimes without possibility of refusal or punishment, or simply as punishment and loss of consciousness. Or sometimes they simply send your lover away against his will, to serve someone else. Because your lives are not your own. Again: Your life is not your own. As a mage, you are dragged from home, caged, watched, victimized, and then told what to do and where to do it. So many people ask, "Why, Anders?" I understand this, as someone who would have fought his agenda in the end (and who in fact did not get the romance trophy because I refused to help him and even tried to warn Elphina). However, in spite of that, and in a fictional universe? I admit that, going through everything he and the other Circle Mages suffered... I've had moments where I asked, not "Why, Anders?" but, rather: "What took you so long?" Is what he does right? No. Is it acceptable? No. Is it appropriate? Absolutely not. But is it surprising? No. It's incredibly sad to admit. But... no. 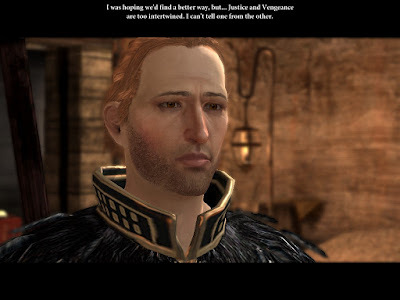 I'll have more exploration of Anders in future posts, especially addressing his actions across Dragon Age II as well as his romance, but while I won't end this with the frequent fan clarion call that "Anders was right," I will admit, rather, that... "I understood why Anders did what he did. Even if it was wrong." In the meantime, I'll simply state my own point of view: That the Chantry and the brutal Circle system created Anders. He is their monster, their literary Frankenstein loosed upon Thedas, both figuratively and literally. Given that fact, to me, it was both ironic, tragic, and appropriate that the Chantry suffered for that creation. I only wish it could have happened without the loss of innocent lives. I disagree with the premise that what Anders did was wrong or unforgivable, but I won't debate that point since your analysis was interesting & sympathetic. I will say that Anders telling Sebastian that he was never raped or beaten doesn't mean that's true; I'm 90% sure that he makes references to being kicked in the head in Awakening. Plus, Sebastian kinda treats him like crap, & I don't think that he's going to give Sebastian more ammo to mock mage suffering like he does with the very real threat of the Tranquil Solution. Meredith isn't being vulnerable there, though; she's being *manipulative*. If you actually side with her, you see that she & the other templars are excited by the opportunity to kill the mages under their charge. At one point, she can tell you that she wants the Circle to be a place of fear. Now, when you go into the Gallows & see the mages there, you might think, "How is this not a place of fear already?" but it's not nearly fearful enough for Meredith & she needs your help to realize her vision. The fact is, Champions in the Free Marches are basically like Dwarven Paragons; when a Champion speaks, even the nobles shut up & listen. No matter how pro-mage or pro-Templar you may have been up to this point, anytime Hawke is in front of her is a chance for Meredith to sway you to her side/reaffirm your loyalty. She wants you to see her crocodile tears & become/remain sympathetic to her genocidal plans. Rene, thanks for the thoughtful reply. I definitely agree that Meredith is capable of an enormous amount of manipulation, and that she does in fact attempt to do so (with Hawke, Orsino, and others) several times throughout DA2. However, I do think she's being somewhat honest in the moment you mention, and that's what makes it so chilling and interesting for me. She is willing to execute every single mage in the Circle -- and she'll even feel a tiny bit bad about it. It doesn't change the fact that she's still a monster (and a slightly twisted and tragic one).